The Snom VOIP Corded Desk Phone D712 is built for HD audio from the ground up. The D712 delivers a superior call quality in both handset and hands-free use with its advanced speaker and microphone system along with support for a range of audio codecs. The D712 supports the latest VoIP security protocols using a pre-installed certificate to ensure secure communications. The advanced remote management and provisioning capabilities make the D712 an ideal endpoint for service providers of hosted VoIP deployments, while the IPv6 capabilities also make it a perfect fit for large-scale installations. 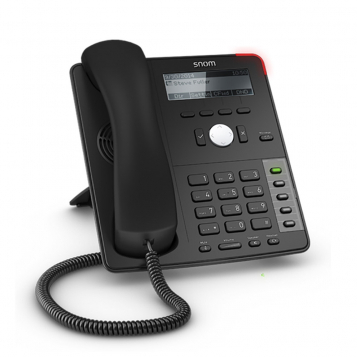 With up to four SIP (Session Initiation protocol) identities, the D712 is a flexible enough to use in demanding environments and a great option when it comes to everyday business telephony. The full Snom D712 datasheet can be found here.